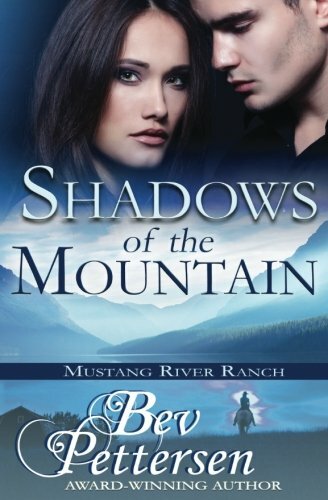 “Shadows of the Mountain” by Bev Pettersen is a thrilling romantic western suspense, full of action drama and of course, love. Readers will have a hard time putting this one down! Kate Miller is a survivalist expert who experiences a horrible tragedy that destroys her confidence and leaves her with a phobia of heights. To get away from the memories, she takes a job at the Mustang River Ranch, where she teaches a survivalist class and has a variety of other duties. When asked to be a substitute on a trail ride to see wild mustangs, she accepts as long as she knows she won’t have to go up the mountain. Her curiosity is piqued when she is given very specific instructions about this ride which involves two teenage girls. She soon discovers that one of the teens is the president’s daughter, and that, along with the Secret Service, a private bodyguard, Jack Becker, will be going along on the ride. The minute that Kate and Jack meet, sparks start flying. As the trail ride begins, Kate notices something is off and she is afraid the girls are in danger. Unsure of whom she can trust, Kate keeps her concerns to herself until it is almost too late. Kate and Jack soon find themselves on the run, acting as decoys so that girls can be rescued. As they are chased, Kate is forced to confront her deepest fears. The suspense is tremendous! I really enjoyed reading “Shadows of the Mountain” and found it impossible to put down! Bev Pettersen really knows how to write the perfect romantic suspense. Her characters are so authentic and enticing, and I like that they are so knowledgeable about horses. Using the horses to help relay information about what is going on around them before the humans are aware, adds to the suspense. The chemistry between Jack and Kate is incredible and you will feel the tension build between them. This made it even harder to put the book down because I couldn’t wait to see what would happen next! I highly recommend “Shadows of the Mountain” by Bev Pettersen to fans of romantic suspense. It would also be a perfect selection for a romance reading group. I look forward to reading more novels by this author.